The Ariadni dimmer provides optimal dimming performance of LED bulbs. This dimmer works with up to 150 Watts of dimmable LED/CFL or 600 Watts of incandescent/halogen, allowing you to control multiple bulb types on the same circuit. It is designed to control a broad range of dimmable LED and CFL bulbs from a variety of brands including Philips, Cree, GE, EcoSmart and Lighting Science. The Ariadni dimmer features a toggle switch to turn your lights off or on--- returning the lights to your favourite level. Adjust your light to any activity. using the discreet slide control next to the switch. Coordinating Claro wall plate sold separately. The Diva 150 Watt C.L works with dimmable LED and CFL screw-in bulbs up to 150 Watts and is also compatible with up to 600 Watts of standard incandescent and halogen bulbs, allowing you to control all 4 bulb types on the same circuit. It is designed to control a broad range of dimmable LED and CFL bulbs from a variety of brands including Philips, Cree, GE, Eco Smart and Lighting Science. 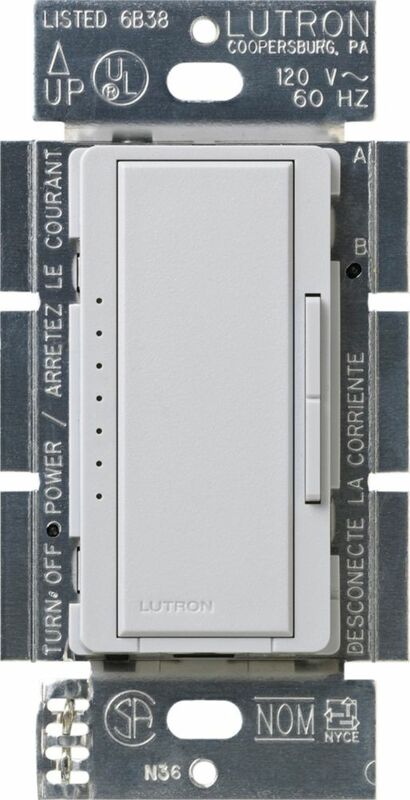 With the same features as Lurton's Diva Dimmer, the large paddle switch turns the light on/off and returns to your favorite setting. The discreet slider adjusts the light level to suit any activity. Please see Lutron's Compatible Bulb List to view the current listing of compatible bulbs that work with this dimmer. Coordinating Claro wall plate sold separately. The Contour dimmer provides optimal dimming performance of LED bulbs. This dimmer works with up to 150 Watts of dimmable LED/CFL or 600 Watts of incandescent/halogen, allowing you to control multiple bulb types on the same circuit. It is designed to control a broad range of dimmable LED and CFL bulbs from a variety of brands including Philips, Cree, GE, EcoSmart and Lighting Science. The Contour dimmer features a smooth slide, captive knob to adjust your light to any activity. Use the rocker switch to turn your lights off or on---returning the lights to your favorite level. Coordinating Claro wall plate sold separately. Control the next generation of lighting with Lutron's family of dimmable CFL/LED (C.L) dimmers! Dimmable compact fluorescent lamps (CFLs) and dimmable light emitting diode lamps (LEDs) are a great energy-saving alternative to incandescent or halogen light sources, however, dimming them may be difficult. This dimmer provides a solution to alleviate your CFL and LED dimming challenges. The Toggler C.L dimmer features advanced dimming circuitry that is designed for compatibility with most high efficacy light bulbs. This dimmer also provides full-range dimming for halogen and incandescent bulbs, The Toggler C.L matches your existing toggle switches. It features a slider to adjust your light to any activity, and the toggle switch turns your lights off or on---returning the lights to your favorite level. Coordinating Fassada wall plates and accessories purchased separately.